Apply for Dalian-based CHINACCELERATOR Incubator Program NOW! 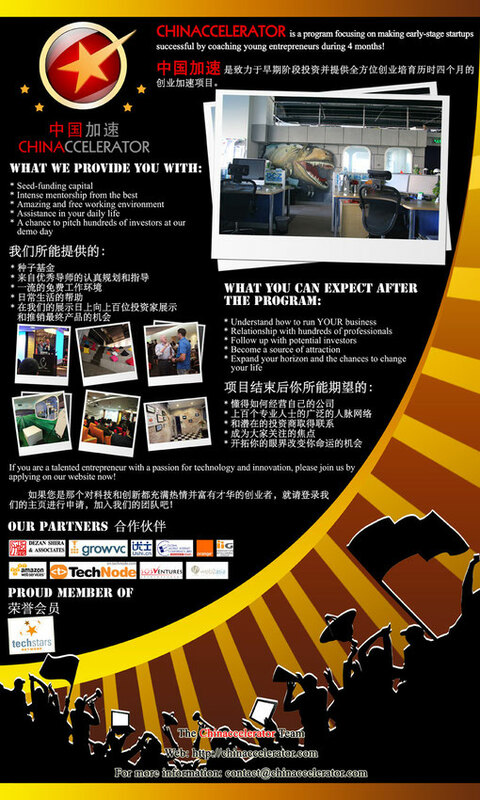 Chinaccelerator is a 4 month startup accelerator, based in Dalian/China and hosting its second batch in June 2011. The program is part of the TechStars network and offers extensive support for startups including seed funding, mentorship, and free office space. If you are ready to rock the technology space, it's time to APPLY NOW! Applications will be closing on May 15th. Extra budget of 10,000 CNY per company (for research, sales, marketing, product development, etc...). A chance to pitch investors at the demo day. All CA asks is some equity in return (4 to 8%). Here is an overview of last years startups that participated out of which 3 already received follow-up VC funding: http://chinaccelerator.com/en/startups. Below are 2 presentations with details on the program and an shapshot of what life is like at CHINACCELERATOR. Check it out.